Anaheim is known as a fun city, of course. It is home to Disneyland, but it is also a major convention city. The Anaheim convention center is a beautiful glass building, and it is one of the best venues for conventions. If you are going to visit Anaheim, as an exhibitor or as an attendee to one of the conventions, you might consider a short term rental rather than staying in a hotel. This will be more amenable than a sterile hotel room, and you can choose your location – near or far from the convention center. (You can check out the Anaheim Convention Center Calendar online). Near to the convention center has the advantage of ease-of-use, and you can get there quickly. This is especially important if you are an exhibitor. But far from the convention center is also interesting – for example in Laguna Beach, which is on the ocean pretty far from Anaheim but very cool. Whatever your short term rental need is in Anaheim, Key Housing has a property that can suit you and your team. 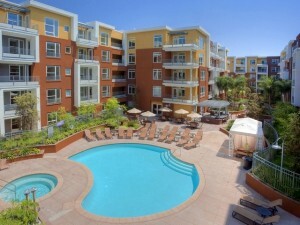 For example, check out our featured property in Anaheim. Here is our featured Anaheim short term rental. This luxury Southern California apartment community located in the heart of Orange County. These decadent 1-, 2- and 3-bedroom Anaheim apartments come with top of the line features such as fully-equipped gourmet kitchens featuring granite counter tops, contemporary appliances, and maple finish cabinetry. Residents also enjoy a host of luxurious amenities including a sparkling swimming pool, rooftop deck with outdoor fireplace, and state-of-the-art fitness center. When you add in our professional on-site management and highly desirable location, it’s not hard to see why so many people love our Anaheim apartments. If you are interested in an Anaheim short term rentals, please reach out to us via our Website.